2. 6+/- Acre lot in Gardner Place. Views, level, paved road frontage, and creek. Tracts range from 5 to 27 Acres. Selling in 10 tracts or as a whole! Terms: 20% day of sale, closing to be within 45 days of sale. Announcements day of sale take precedence over all advertising. This is a one of a kind farm located in the beautiful Sequatchie Valley. Farms in this highly desirable area do not become available very often. This is your chance to get the property of your dreams. Saturday, September 29, 10:02 AM, CST. 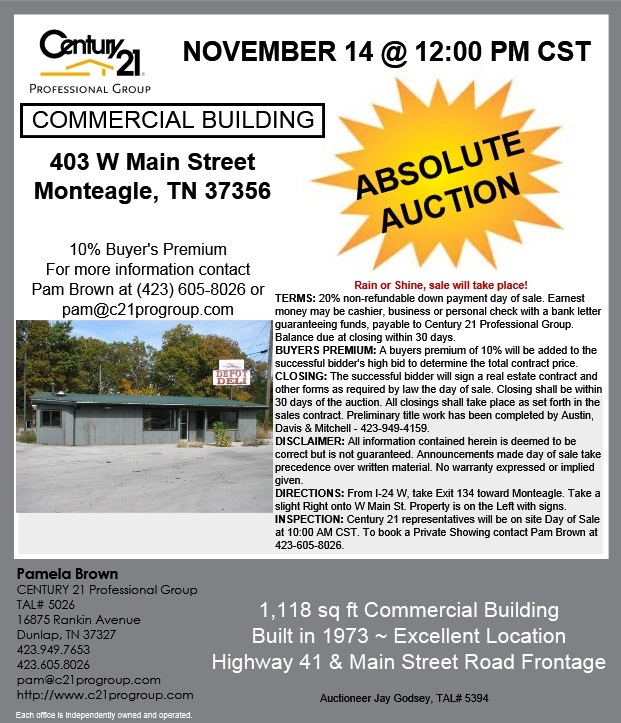 Several Lots Being Sold ABSOLUTE!! Selling in Tracts, Combinations or as a Whole! Terms: 10% Day of Sale. Balance within 30 days. 10% Buyers Premium added to final bid. Saturday, October 27, 10:02 AM, CST. Saturday, September 8, 10:02 AM, CST. 20+/- Acres Blue Sewanee Rd.